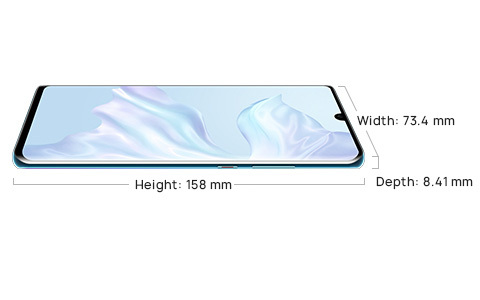 Note: With a rounded corners design on the dewdrop display, the diagonal length of the screen is 6.47 inches when measured according to the standard rectangle (the actual viewable area is slightly smaller). *This function should be used with the USB 3.1 GEN1 cable (non-standard USB cable, need to be purchased separately) that supports this function. supports autofocus (phase focus, contrast focus), supports AIS (HUAWEI AI Image Stabilization). *The Battery Rated Capacity is 4100mAh. **Typical value. Actual capacity may vary slightly. *IP68 is splash, water, and dust resistant and were tested under controlled laboratory conditions with a rating of IP68 under IEC standard 60529. Splash, water, and dust resistance are not permanent conditions and resistance might decrease as a result of normal wear.